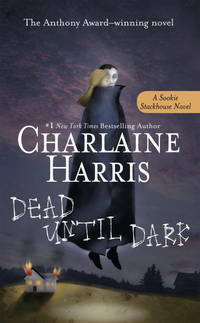 Dead Until Dark is the first book in Charlaine Harris's series The Southern Vampire Mysteries / Sookie Stackhouse novels. In this first installment, the author introduces the character of Sookie Stackhouse, a young telepathic waitress from the fictional town of Bon Temps, Louisiana, and her world, an alternate history where vampires, shapeshifters and other supernatual beings coexist with humans. CloggieDownunder (Thirroul): Dead Until Dark is the first book in the Sookie Stackhouse series by popular American author, Charlaine Harris. A cocktail waitress at Sam Merlotte's bar in Bon Temps, Louisiana, Sookie Stackhouse meets her first vampire when he sits as one of her tables. Bill Compton is trying to live in the mainstream since vampires "came out of the coffin" some four years before. Sookie has a unique (dis)ability that allows her to read minds, so she finds it quite refreshing to hear nothing at all from Bill's mind. But something she does hear from his drinking companions sees her actually saving his life (if that's possible with someone who is effectively dead until dark). Bill has been restoring old Jessie Compton's house near the cemetery and close to Sookie's grandmother, Adele's house. His age and Civil War activity make him of interest to Adele and her friends, while Bill and Sookie can't deny an attraction between them. But Bill's vampire friends have Sookie concerned, and when young women start turning up strangled, with vampire bites on them, suspicion turns to the undead. Then another shocking murder has Sookie afraid for her own life. This first book of the series introduces some of the regular characters and establishes some of the ground rules for the world Harris has created. Her heroine is a feisty woman, a likeable person with a strong sense of independence who is, nonetheless, not immune to a bit of romance. Readers who enjoy this installment will be pleased to know there are a further twelve books in the series, as well as four associated books. Vampire fun! Turtleback, 2001-05-01. School & Library Binding. Used:Good. Turtleback, 2008-09-03. Reprint. Library Binding. Used:Good. 2008-08-02. New. Ships with Tracking Number! INTERNATIONAL WORLDWIDE Shipping available. Buy with confidence, excellent customer service! 2001-02-06. New. Ships with Tracking Number! INTERNATIONAL WORLDWIDE Shipping available. Buy with confidence, excellent customer service! 2009-08-01. New. Ships with Tracking Number! INTERNATIONAL WORLDWIDE Shipping available. Buy with confidence, excellent customer service! 2008-05-08. New. Ships with Tracking Number! INTERNATIONAL WORLDWIDE Shipping available. Buy with confidence, excellent customer service! Ace, 2008-01-02. Hardcover. Good. 8.1000 inches 5.3000 inches. First Edition / First Printing as identified with ""1"" in the full number line. 2011-02-09. New. Ships with Tracking Number! INTERNATIONAL WORLDWIDE Shipping available. Buy with confidence, excellent customer service! 2001-04-07. New. Ships with Tracking Number! INTERNATIONAL WORLDWIDE Shipping available. Buy with confidence, excellent customer service! 2008-06-08. New. Ships with Tracking Number! INTERNATIONAL WORLDWIDE Shipping available. Buy with confidence, excellent customer service! 2008-08-02. Good. Ships with Tracking Number! INTERNATIONAL WORLDWIDE Shipping available. May not contain Access Codes or Supplements. May be ex-library. Shipping & Handling by region. Buy with confidence, excellent customer service! 2004-06-01. Good. Ships with Tracking Number! INTERNATIONAL WORLDWIDE Shipping available. May not contain Access Codes or Supplements. May be ex-library. Shipping & Handling by region. Buy with confidence, excellent customer service! Ace. Hardcover. 0441015972 Please allow 4 - 14 business days for Standard shipping, within the US. Thank you for supporting our small, family-owned business! . New. 2008-01-02. Reissue. Ace. Hardcover. 0441015972 Please allow 4 - 14 business days for Standard shipping, within the US. Thank you for supporting our small, family-owned business! . Fine. 2008-01-02. Reissue. Turtleback Books. LIBRARY BINDING. 0606144242 Like New Condition. . Fine. Turtleback Books. LIBRARY BINDING. 0606144242 New Condition. . New. Ace Trade, 2009-07-07. Reprint. Paperback. Used:Good. Turtleback Books. School & Library Binding. GOOD. Spine creases, wear to binding and pages from reading. May contain limited notes, underlining or highlighting that does affect the text. Possible ex library copy, thatâll have the markings and stickers associated from the library. Accessories such as CD, codes, toys, may not be included. Ace Hardcover, 2008-01-02. Reissue. Hardcover. Used:Good. Ace. PAPERBACK. 0441019331 New Condition. . New. Turtleback Books. SCHOOL & LIBRARY BINDING. 0613656504 New Condition. . New. Ace. Hardcover. 0441015972 New Condition. . New. Gollancz. PAPERBACK. 0575089369 New Condition. . New. Wheeler Pub Inc. PAPERBACK. 1587246309 New Condition. . New. Ace Trade. PAPERBACK. B002ZNJWGI New Condition. . New. Ace. PAPERBACK. 0441018254 New Condition. . New. 2001-04-07. Good. Ships with Tracking Number! INTERNATIONAL WORLDWIDE Shipping available. May not contain Access Codes or Supplements. May be ex-library. Shipping & Handling by region. Buy with confidence, excellent customer service! 2010-08-07. Good. Ships with Tracking Number! INTERNATIONAL WORLDWIDE Shipping available. May not contain Access Codes or Supplements. May be ex-library. Shipping & Handling by region. Buy with confidence, excellent customer service! 2009-08-01. Good. Ships with Tracking Number! INTERNATIONAL WORLDWIDE Shipping available. May not contain Access Codes or Supplements. May be ex-library. Shipping & Handling by region. Buy with confidence, excellent customer service! 2001-02-06. Good. Ships with Tracking Number! INTERNATIONAL WORLDWIDE Shipping available. May not contain Access Codes or Supplements. May be ex-library. Shipping & Handling by region. Buy with confidence, excellent customer service! Turtleback, 2008-09-03. Library Binding. Good. 2008-05-08. Good. Ships with Tracking Number! INTERNATIONAL WORLDWIDE Shipping available. May not contain Access Codes or Supplements. May be ex-library. Shipping & Handling by region. Buy with confidence, excellent customer service! 2011-02-09. Good. Ships with Tracking Number! INTERNATIONAL WORLDWIDE Shipping available. May not contain Access Codes or Supplements. May be ex-library. Shipping & Handling by region. Buy with confidence, excellent customer service! Wheeler Pub Inc. PAPERBACK. 1587246309 Like New Condition. . Fine. Ace Trade. PAPERBACK. B002ZNJWGI Like New Condition. . Fine. Gollancz. PAPERBACK. 0575089369 Like New Condition. . Fine. Ace. PAPERBACK. 0441019331 Like New Condition. . Fine. Ace. Hardcover. 0441015972 Like New Condition. . Fine. Ace. PAPERBACK. 0441018254 Like New Condition. . Fine. n/a. Used - Very Good. Former Library book. Great condition for a used book! Minimal wear. Orbit. Used - Good. Shows some signs of wear, and may have some markings on the inside. Turtleback Books, 2001-05-01. School & Library Binding. Like New. Very gently handled. Appears unused. Well taken care of. Ace Books. Mass Market Paperback. 0441008534 Please allow 4 - 14 business days for Standard shipping, within the US. Thank you for supporting our small, family-owned business! . New. 2001-05-01.